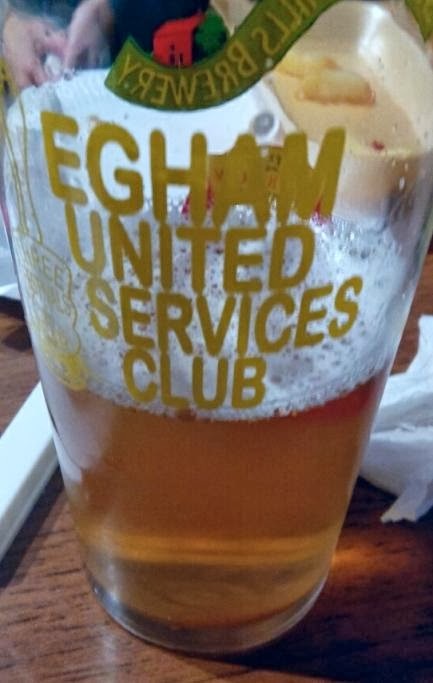 It was over to Egham this afternoon for the 16th Egham Beer Festival - there's three a year, so it's not quite as old an event as that makes it sound! I'd been to there before, although not for a few years, so I kind of knew what to expect: half a dozen real ales on handpump inside, and several more on a gravity stillage in the yard outside. It was even more impressive than I remember, though - more like a dozen handpumps inside, and more handpumps outside, as well as several casks on gravity. The beer list was really interesting too, with lots from new breweries, especially around the London area. It's also a very friendly venue, and as a members' club it is not just open to families but actively welcomes them. 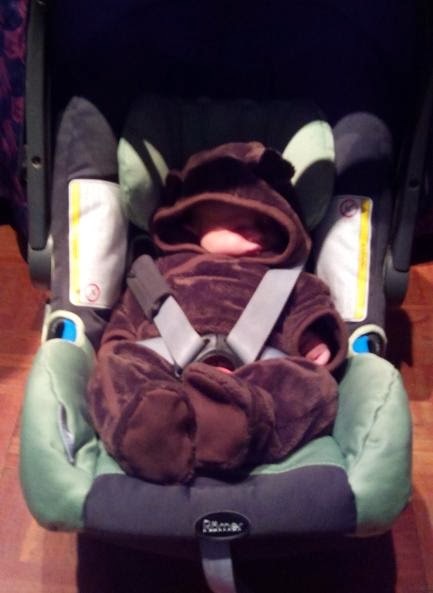 À propos of which, I know this blog has been a tad quiet of late, well here's why: this is the youngest attendee at the festival, aged just over a week, so as you might guess I've been a bit distracted of late. And yes, she and her elder brother were very well behaved and didn't annoy anyone, in fact she slept through the whole thing. As to the beers, there were two or three standouts, only partly defined by how well they cut through the foul cold that has me sneezing and sniffling all over the place. I was especially impressed by Black & White IPA, which is the latest London Brewers Alliance special, a black IPA brewed at By The Horns, and then by two beers from Kent Brewery, which I don't remember meeting before despite it being three years old. The first of these was Elderflower Saison, a beautifully complex, crisp and floral Belgian-style pale ale. The second was Dead of Night, a variation on Kent's highly regarded 5.5% porter that includes cherries - the result is dry, herby and ashy-bitter, with a noticeable red fruit tang. But perhaps the most impressive of the lot was Plateau, a pale ale from a brand new - as in, so new they only started brewing about six weeks ago - Sussex brewery called Burning Sky. Just 3.5% ABV, Plateau features a mix of American and New Zealand hops for a spicy and tropical fruit character, and is immensely refreshing and satisfying, drinking considerably above its strength, if you know what I mean. Forgot to add, I've heard lots of good things about the Egham Beer Festival, from a variety of very different people. Must try and get along to the next one, whenever that might be? There's three a year, I think the next should be first weekend of April or thereabouts.